It has been a tough few weeks around here. But there have been happy moments as well. Our son turned seven. My wife and I celebrated 17 years of marriage. We are now at around a month before the Bel Monte Endurance Races. I had planned for and registered for the 50k race. As you may know, I’ve been battling knee issues, IT band issues, and other challenges while training. The brutally cold winter hasn’t helped me stay on track either. The Pinhoti Trail as it picks up at the Snake Creek Trailhead. After a tough training run this weekend, I’ve decided to drop down to the 25k race at Bel Monte. It seems like a good idea to be safe, injury-free, and accomplish something. At the same time, I’d hate to make more work for the volunteers or cause another racer injury or duress trying to help me. I hope that if the race goes well, it will be a springboard for a summer of strong training and a trail marathon in the early fall with maybe a 50k in the late fall. At any rate, Saturday was a painful and humbling run on a beautiful trail with some wonderful weather. I was down in Dalton, GA where my in-laws live and had the chance to spend some time on the famed Pinhoti Trail. 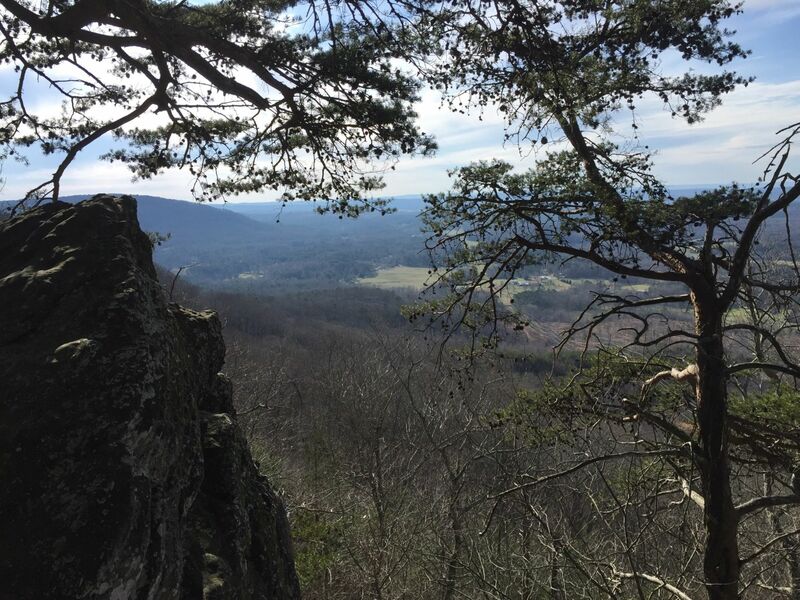 The Pinhoti is a trail that runs from Alabama into northwest Georgia and nearly connects to the Appalachian Trail. 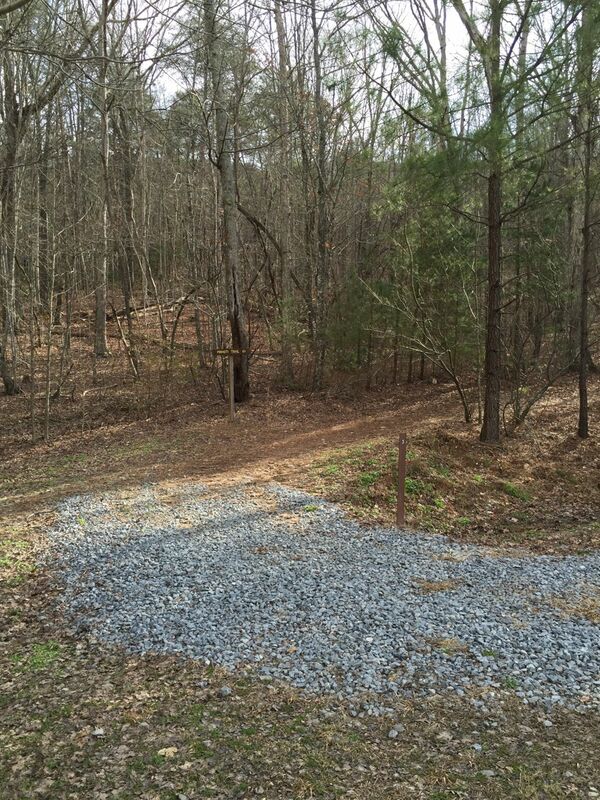 It’s not a complete wilderness trail as it cuts through some smaller towns including Dalton. Blasted trees near Mill Creek Mountain. The section I tackled starts at a parking area and trailhead called Snake Creek Gap. Over the course of over 15 miles, the trail crests four peaks starting with Mill Creek Mountain, moving to Middle Mountain, then Hurricane Mountain, and finishing on the top of Dug Mountain. The whole section gives you about 2,500 feet of elevation gain. There are some decent views of the surrounding ridges and near Dug Mountain a few expansive views of Dalton. Amazing views from the crest of Dug Mountain. It’s an extremely rocky trail with several challenging vertical sections that seem to eschew switchbacks in favor of stair-stepping large boulders. At one point, I was actually cursing the rocks. I was actually pointing and cursing rocks that seemed to jump up and snag my feet. It was one of the most mentally challenging runs I’ve had in recent memory. I just wanted to get off the mountain as fast as possible. The trail is popular with bikers who must be highly skilled or else carry their bikes across some sections because it’s often just a pile of rocks. 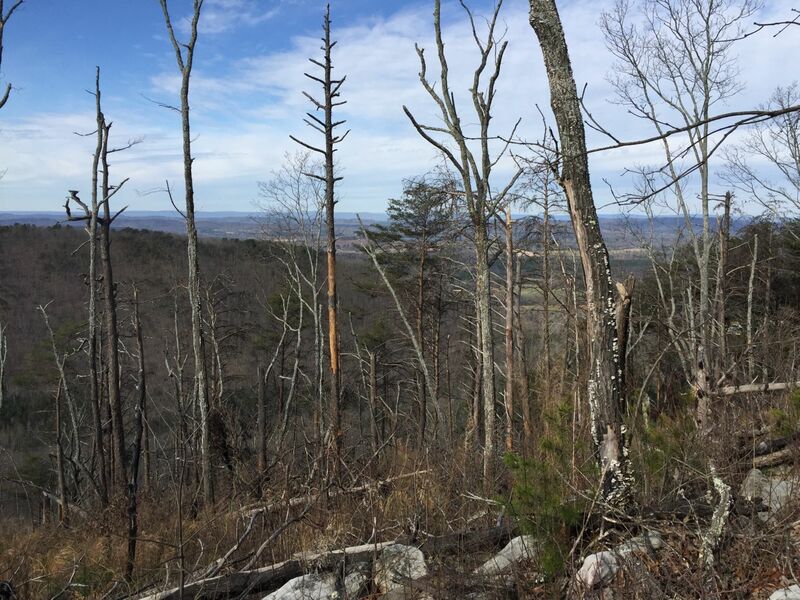 While the trail does provide its share of challenges, the trail is accessible enough for most hikers and is close to the surrounding communities making it a strong option for outdoors folks in north Georgia. The rocky trail ultimately led me to the decision mentioned above as my ankles and feet just aren’t going to be ready for 50k of this. I hope that the next time we are visiting family, I can give the trail another shot and try to improve on a really tough day out.